Based on reviews and plenty of first-hand customer experience, we’ve selected 3 top picks for the best live bait cooler, and the good news is that none of them are super expensive and each one will be a sure-fire way to help you catch more fish in the long run. Unless you’re fishing with artificial lures, the success of any fishing trip ultimately comes down to the bait you have — no bait equals no fish, simple as that. That being said, any real fisherman knows it’s absolutely vital to keep your bait – whether it be shrimp, crabs, minnows, or whatever else – fresh and lively throughout the day. Obviously a livewell that continuously pumps fresh water in and out is the best option for this (if your boat has one), but if you don’t have one (or if you’re a shore fisherman), the next best thing to invest in is an aerated live bait cooler. The Engel live bait cooler is our #1 pick, hands down. It comes in three different sizes (13, 19, and 30-quarts), and has far and away the best customer reviews out of all the different live bait coolers out there. The cooler itself is constructed like a top-end rotomold, with thick polyethylene walls and molded polystyrene insulation. The goal with the beefed-up insulation is to protect your live bait from extreme temperatures – both hot and cold. Little baits like shrimp and minnows are super susceptible to changes in their environment – the more constant you can keep their surroundings, the longer they’ll survive. In addition to the heavy duty construction, the Engel Live Bait Cooler is fitted with marine-grade stainless steel hardware throughout, and is equipped with a 360-degree recessed freezer gasket — definitely built with the quality you’d expect from a name like Engel. The gasket is important for insulation and helping to maintain the internal temperature, but it’s also a great feature during transport when you’re driving from the bait shop to your fishin’ hole, so you don’t have to worry about water splashing all over the place. As far as the aeration system, the cooler uses a 2-way, 2-speed BC 19 pump that will easily last all day on a single charge. You can kick it into high gear when you first get your bait (or during the heat of the day), then switch it down to low gear later in the afternoon to conserve battery. The ‘2-way’ electric system means that it can run on two different power supplies; when using it portably it runs off of two D-Cell batteries, but if you’re trying to keep it running overnight you can plug it into your car’s 12-volt outlet for a continuous power supply (it comes with a 12V cigarette lighter-style adaptor). As far as carrying/transporting the cooler, it’s really a breeze. Each size comes with a padded shoulder strap so you can sling it across your back and haul it and all your other gear out to the hot spot. Or, if you don’t use the shoulder sling it’s got an integrated handle built into the lid as well. Like we mentioned earlier, reviews for the Engel Live Bait Cooler have been really positive. There are a few folks who were worried the plastic housing on the rear hinges might be prone to breaking over time, but the large majority of customers were super pleased with the overall construction. Also, a lot of people mentioned that they use theirs as a cooler and dry box just as much as they use it as a bait well – all you have to do is detach the hose and pump, and you’ve got a really high quality, heavy-duty molded cooler on your hands. Lots of people also love the fact that it comes with an internal hanging tray for storage and organization, which they said is perfect for separating their dead or cut baits from the live bait below. Here’s a really good video review of the Engel Live Bait Cooler in action. 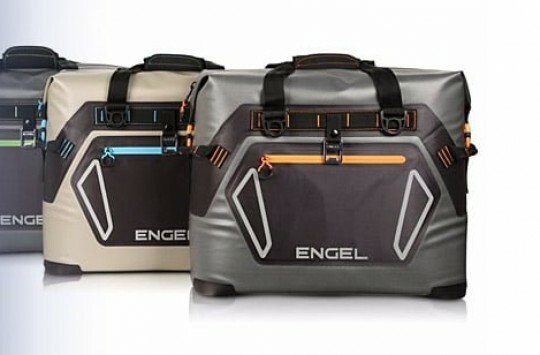 TIP: Read full review of Engel Cooler series here and find out how it compares vs the Yeti lineup. The Personal Bait Station from Frabill is another good pick that’s a little cheaper than the Engel. Though at 8-quarts, it’s quite a lot smaller and there’s only the one size option available. If you do mostly lake or pond fishing and use small minnows for things like crappie, this is a good choice. For saltwater fishing though if you usually use jumbo shrimp or large baitfish, it might be a bit small. Also, construction and feature-wise the Frabill is slightly less up to snuff than the Engel. Instead of molded polystyrene insulation (which is the highest quality you can get), it’s got standard plastic walls that you might find on any entry-level Coleman or Igloo. Not terrible, but it doesn’t offer near the quality insulation as the foam-filled Engel does, meaning your baits will be less protected from environmental changes and will probably die quicker as a result. One thing that a lot of people really do like about the Frabill is its lift-out net liner; instead of chasing minnows around with your bare hand, you can simply lift the mesh liner out and all your baits will be there flopping around and easy to pick off. Also, a lot of folks seem to really like the quality of the waterproof lid latch, which just like the Engel allows them to keep the cooler in the backseat of their car after hitting the bait shop, without having to worry about water spilling everywhere. The aerator pump runs on D batteries just like the Engel does, but since this is a smaller cooler it just runs on one battery at a time – you’ll probably notice it has longer battery life overall. Just be sure to remove the batteries when you’re not using it. One other thing to consider is that this cooler doesn’t have the 12V car adaptor like the Engel does – it only runs off the D batteries. Overall this is a great little live bait cooler that’ll keep your baits frisky and kicking just as long as the Engel, just bear in mind that it’s quite a bit smaller at only 8-quarts. For kayak fishing, it’d be absolutely perfect. (Frabill just recently came out with a new model of the Bait Station, which you can find here for much cheaper than the old model. The only real difference we can see is that the old one was Made in the USA, while the new one is made in China). As far as performance and overall quality, the Frabill and Engel live bait coolers are definitely our top picks – if you’re willing to drop $40-$70 bucks, they’re the best ones around. However if you’re not looking to spend that much money, we’ve got a couple other picks that may float your boat – just don’t expect the same high-quality performance out of them that you’ll get from the other two. Actually, this cooler is not a whole lot cheaper than the Engel, but a lot of people like the fact that it’s larger. With the large Engel 30-quart Live Bait Cooler you’ll spend upwards of 80 or 90 bucks, but with this cooler you’ll have over 20-quarts of volume for just under $50. The 2-speed aerator pump is actually pretty nice, and it will easily last 24-hours running full time. The only thing it doesn’t have is the 12V adaptor cord for continuous running. Another thing we like about this cooler is its oval shape – a lot of people don’t know this but baitfish have a natural tendency to school up and swim in circles, so bait boxes and livewells that are circular or cylindrical provide more of a natural habitat, minimizing the chance the baits will become over-stressed and die. Kind of an off-the-wall feature, but something to think about. Lastly, one other favorite user feature is how easy and convenient it is to carry/transport. It has a full shoulder sling and multiple mesh pockets on the outside for stashing tackle, pliers, and other odds and ends while you dash to and from fishing spots. Oh and one final thing – tons of customers have been super satisfied with how it performs as an actual cooler too – when they’re not using it as a bait well, they’ll simply take the pump off and it’ll hold up to 24 12-oz cans and 8 lbs of ice. Also, the lid doubles as a fillet board – a killer feature that allows you to cut bait and/or fillet your days’ catches right there on the spot. The South Bend Insulated Bait Holder is a super cheap, super basic live bait cooler that’s about as simple as it gets. It’s got a really nice molded design with a durable exterior, and has a fully insulated foam core to help maintain internal temperature and keep your baits happy (until you impale them with a razor sharp hook). This doesn’t have any fancy features like stainless hardware or 360-degree gaskets, but at less than 20 bucks we don’t really expect it to. Also, this cooler doesn’t come with an aerator pump – it’s essentially just an insulated box that works to maintain internal temps and minimize stressors on the critters hanging out inside. And of course, it can double as a simple cooler if need be. 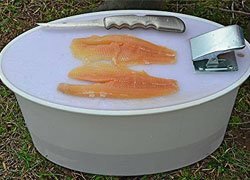 Most people use this box when fishing with worms, leeches, crickets, or nightcrawlers, and claim it really does help keep them cool, fresh, and lively. A lot of people also mentioned they love the fact they can hook it on their belt – absolutely perfect for wade fishing in rivers, creeks, and ponds. Size-wise it’s a pretty small box that’s super light (only 4 oz), and measures about 7” x 6” x 4”. Related: One of our earlier posts covered fishing coolers and insulated fish bags. You may want to check it too. Just a tip. If you don’t want to go out and buy a brand new cooler, you can easily turn one you’ve already got into a fully functioning live bait cooler simply by installing a DIY aerator kit. There’s a bunch of these aeration kits out there, but after scouring through tons of reviews it was pretty clear that the pumps on a lot of them were basically useless – they’d either die out after a couple weeks’ use (especially in saltwater), or they’d hardly have any power at all to aerate even a small 10-quart cooler. To ensure you don’t fall for one of these ‘duds’, we’ve gone ahead and selected a list of the best aerator kits you’ll find – these are easy to install, inexpensive, and they’ll keep your baits aerated and super lively even in large coolers up to 120-quarts or more. Definitely the best-reviewed cooler aerator kit out there, and at under 50 bucks it’s a great value buy. The powerful 500 GPH pump produces 99.5% saturation of dissolved oxygen, which will keep up to hundreds of baits alive and frisky even in super large 150-quart coolers. The spray apparatus fits both round and square livewells, and it easily adjusts to fit any size cooler/ice chest. Also, it’s incredibly easy to set up – just clip the copper leads onto any deep cycle battery. Most people say they run theirs off a standard trolling motor battery, and typically get up to 48 hrs of run time on a single battery charge. Plenty of folks also love the fact that the pump is fully submersible in saltwater, and many claim to have been using theirs for years and it still runs perfectly. The SeaChoice is another good option that’s slightly cheaper than the Marine Metal kit, and has had tons of positive customer reviews. The setup is pretty much identical, with the kit easily adapting to fit just about any cooler, livewell, or standard bait bucket, and most people hook it up to their trolling motor battery. The cool thing is that it can be used for a lot more than a livewell pump – several people end up buying two or more and use the other one as a bilge pump or onboard washdown system. Just like the Marine Metal, the SeaChoice comes with 5 ft of flexible hose, and comes with a standard 2-year warranty. Lastly, the Johnson Aerator Kit is a good pick for anyone looking for a slightly smaller, more inexpensive pump. The aerator is 400 GPH unlike the 500 GPH on the Marine Metal and SeaChoice, so it’s a little smaller but will still be plenty powerful to aerate anything up to about an 80-quart cooler. One thing that people seem to like about having a smaller pump size is that they can run it off a smaller battery – many claim they run theirs just fine off of a little deep cycle lawn and garden battery that they pick up for about $30-$40. There aren’t as many reviews for this kit as the other two, but it should be a great, cheap option if you’re trying to convert a smaller sized cooler or ice chest. In summary, live bait coolers are an excellent way to improve your fishing success, while saving hundreds over a fully integrated livewell system. 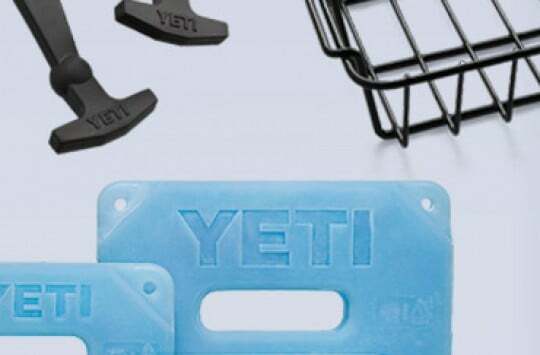 Also, give some serious consideration to a cooler aerator kit if you’re not wanting to go out and buy a completely separate ice chest – they work fantastic and the best part is there’s no drilling or anything like that involved, so you can use your cooler just like normal when it’s not being used as a livewell.